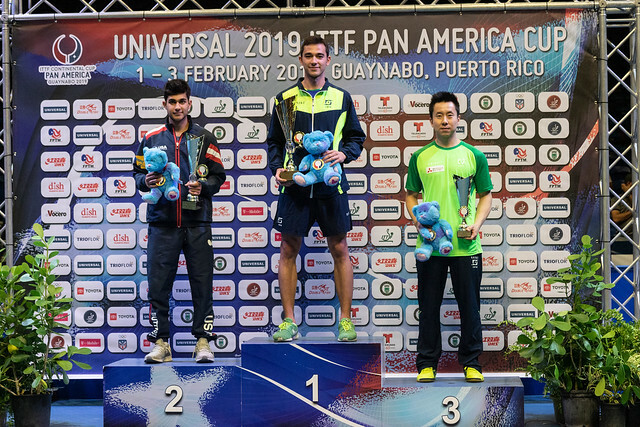 Winner last year of the boys’ singles title at the Pan American Junior Championships in Santo Domingo, four months later the same record of success at the senior version in Santiago; even though only 18 years old Kanak Jha of the United States heads the challenge from north of the border at the forthcoming Universal 2019 ITTF Pan America Cup. A three day tournament play commences in Guaynabo, Puerto Rico on Friday 1st January. Three days of action, it is a number with which Kanak Jha is familiar. In 2018, he beat the host nation’s Marcelo Aguirre to secure third place in the 2018 ITTF Pan America Cup, before later in the year finishing in the bronze medal position in the men’s singles event at the Buenos Aires 2018 Youth Olympic Games. Equally, he has hitherto succeeded in competing in the Liebherr Men’s World Cup on three occasions, his debut being when only 14 years old in Düsseldorf, before in 2017 being present in Liège and last year in Paris. Notably his efforts in the Parisian city where his best to date, he beat Nigeria’s Quadri Aruna to secure second place in his group behind Frenchman, Simon Gauzy, prior to experiencing defeat at the hands of China’s Lin Gaoyuan. Moreover, in Guaynabo, he is the no.3 seed behind the Brazilian duo of Hugo Calderano and Gustavo Tsuboi; the goal is a top two finish in order to gain an invitation to the Liebherr 2019 Men’s World Cup to be staged later in the year in the Chinese city of Chengdu. The target is within reach, the results gained in recent months by Hugo Calderano have been quite outstanding but nothing is impossible and the ball is round; however what of Gustavo Tsuboi? He won the Pan America Cup San José, Costa Rica in 2017 but in the group stage he experienced one defeat. He was beaten by Kanak Jha, a repeat in Guaynabo?